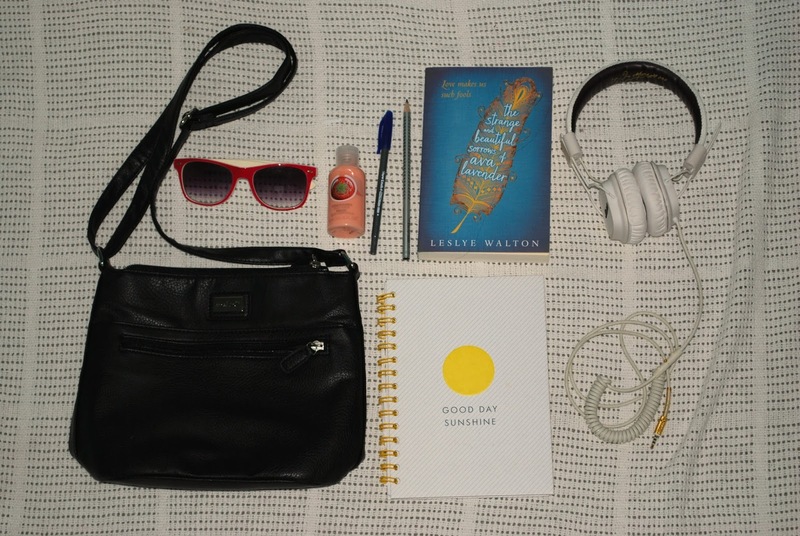 I thought for a post this week I would show you guys my in-flight travel essentials. I don't have that many in-flight essentials, as it is a shorter flight, but I do have some to show. I always bring the smallest bag possible that still easily fits my things. This bag is a Cabrelli handbag, which is a bit like a mix between a satchel and a handbag. I like how easily it fits things, as there are multiple compartments within. This bag was quite pricey, although I got it on sale for $24.99. The first thing I have is a book, as I love reading on the plane. This book is called the Strange and Beautiful Sorrows of Ava Lavender, and it is about a girl born with wings. I haven't read it yet, but it looks very interesting. I packed my white Marshall headphones to listen to music. I am also bringing my phone and earphones incase my ears hurt in the headphones, but I forgot to put them in the photo (sorry guys haha). Another thing I packed to pass the time is a notebook, pen and pencil, just incase I want to write something down or draw. The only skincare item I am bringing on board is some Body Shop strawberry lotion, as planes can be very drying. It's a short flight to Fiji from Sydney (only 5 hours), so I didn't bring any skincare products for my face. I will just use this on my arms and hands for the moisture and smell, because this scent is heavenly! The last essentials are my sunglasses, which I will need when we get out of the airport and into the sun and heat of Fiji. I hope you enjoyed, see you when I get back! 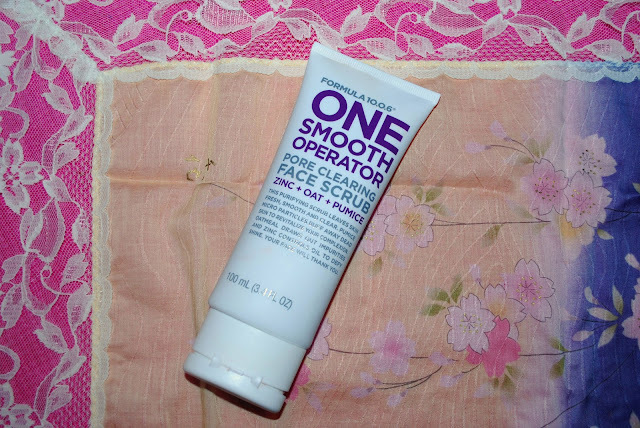 I recently purchased the Formula 10.0.6 One Smooth Operator Pore Cleansing Face Scrub, and I really love it so I thought i would share it with you guys. I get quite a few whiteheads, and so I always keep an eye out for a good exfoliator. I found this one and liked the sound of it, so I bought it and eagerly tried it out. I use it once a week only, as it is a slightly harsher exfoliator, but it has amazing results. After using it once a week for two weeks, I was noticing that it did in fact clear up my skin quite well. It didn't completely clear it up, as my acne is partly genetic, but it did have great (and noticeable) results. I will definitely repurchase this when it runs out. Have you tried this product before? Or what is your go to face exfoliator? It's finally Summer! As much as I love the cold weather, I really love Summer too. I love taking my dog for a walk early in the morning when the weather is the perfect temperature, I love swimming and I love having the sun shining through my bedroom window all day every day. I decided it would be nice to share my Summer favourites, both beauty and fashion. I don't buy new things enough to do monthly favourites, so I am thinking of doing favourites for each season. What do you think - do you like that idea? 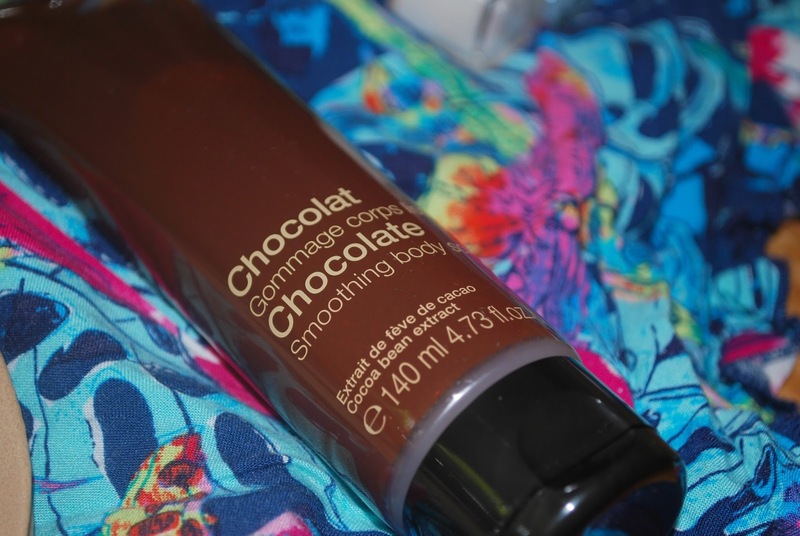 My first favourite is the Sephora Chocolate Smoothing Body Scrub. I got this for my birthday, and I have fallen in love with it! It smells of real chocolate, and it leaves your skin feeling so soft and smooth. I try to use body scrubs more frequently in Summer, as your legs are less hidden by your clothes. The only bad thing about this scrub is the quantity. It only comes with 140mL, and I would love it if it contained more. 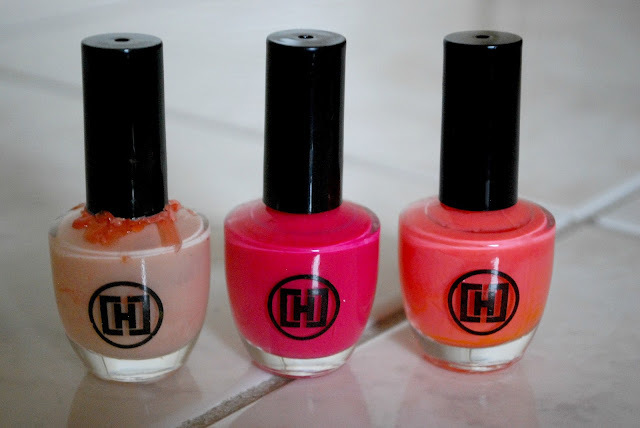 My next two favourites are summery-coloured nail polishes. The first one is the Natio Nail Colour in Lily. It is a pearly white colour, so it isn't just white. 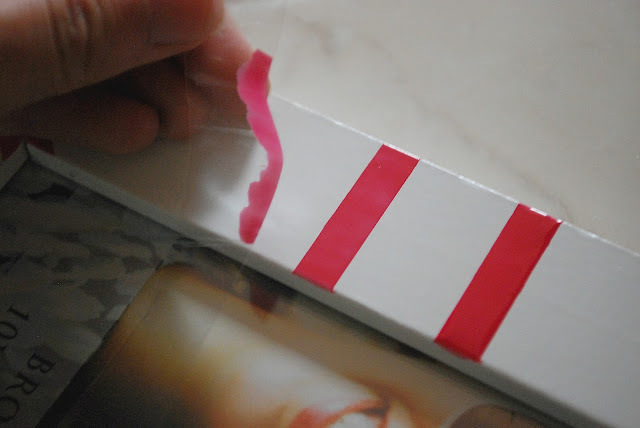 It has a slight pink tinge and I adore wearing this colour in Summer. 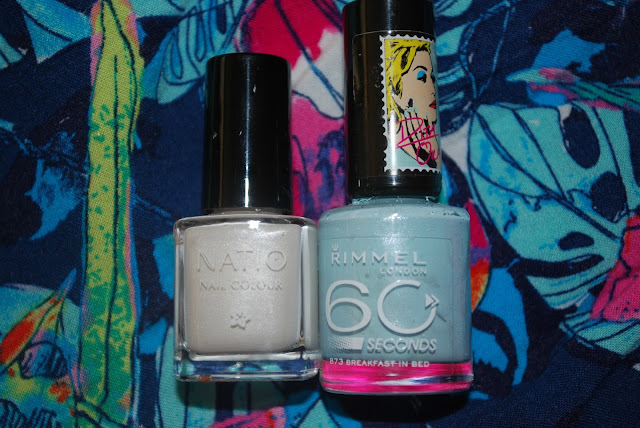 The second nail polish is the Rimmel 60 Second nail polish in Breakfast in Bed. It is a lovely shade of blue that reminds me of beachy colours, making it a perfect nail polish for summer. It dries in more than 60 seconds, but not much more, which is perfect for my impatient self. 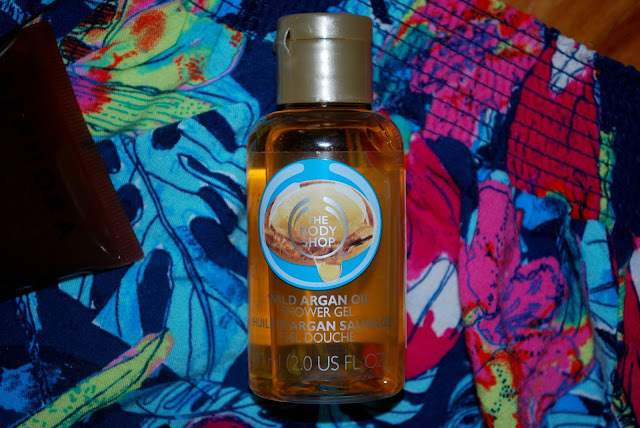 The last beauty favourite is the Body Shop Wild Argan Oil shower gel. I love it's subtle, natural scent for summer. It also comes in a little bottle, great for taking with you on your Summer holiday! 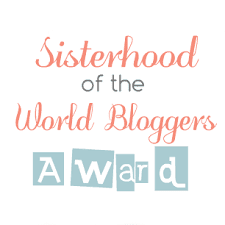 Now onto the fashion favourites! I recently bought new sandals for Summer, and I absolutely love them! I bought them from Novo shoes, 40% off. I love how easily they can be dressed up or down for any occasion. Wearing them with denim shorts or jeans with a white top looks casual and effortlessly fashionable. They could also be paired with a nice, black dress and look just as fancy as the dress. I love the rose gold detailing, and because the bottom is padded, they provide comfort and support. My next favourite are some pyjama shorts. I really like pyjama shorts, there are so many cute designs and patterns on them! These shorts from Sussan have a very tropical pattern, great for summer. The pink flowers and birds really stand out against the deep blue background. I always pair these shorts with either a grey, white or pink t-shirt. Before I go, I just want to wish you all a happy new year! This year has been a really great one, and it feels like just yesterday I was posting my first blog post recipe for the Easter cake I made. I hope you all had a wonderful 2015, but let's make 2016 even better! I just wanted to wish you all a very Merry Christmas, spent with loved ones. I hope you have an amazing day! I can't believe 2015 is almost over - where has the time gone? It feels like just yesterday I was starting out this blog in April this year and writing about my Easter Cake! It's Christmas Eve!! How excited are you for tomorrow? I think I am literally buzzing! For todays Christmas post, I thought I would share with you guys my Christmas Playlist. I've been listening to this non-stop since the start of December! I find that Christmas music is what gives me the most holiday spirit. That and Christmas present shopping! I have a mix of old songs and more recent covers of classics. I have some songs I love musically, but some I listen too just because they get me a festive mood. I also have a few double ups of songs with multiple people singing the original song because I like both versions. It's almost Christmas!! I'm super excited, and I'm getting pretty festive. I've also been Christmas shopping and buying presents for people. 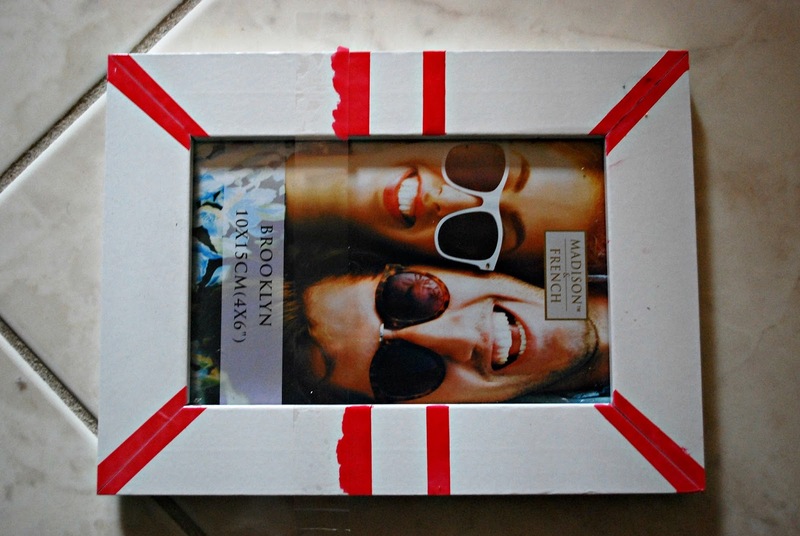 Something I love doing to save money and making a gift more personal is making DIY gifts. 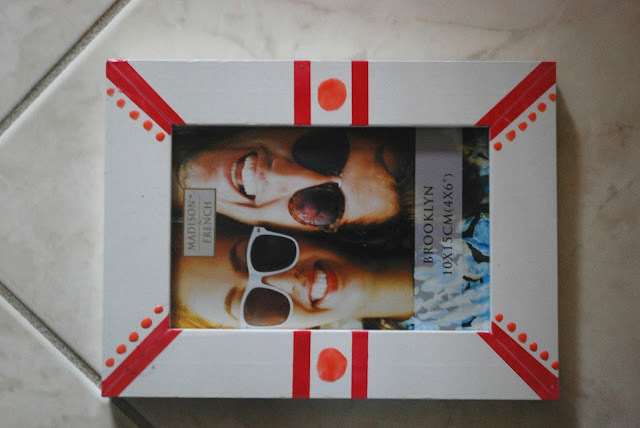 I recently tried this DIY out and I really love it, and thought it would be useful to share with you guys just incase you wanted to do this gift idea for a friend or family member. 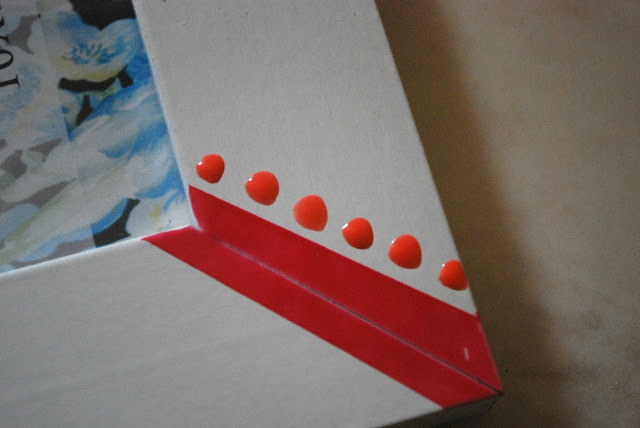 It's a decorated photo frame, and I've painted a design on it using nail polish - how cool is that! I bought a cheap photo frame for less than five dollars from the Reject Shop, and it was perfect as it was wooden, a flat surface and the frame itself was quite wide so there was more space to put the design. 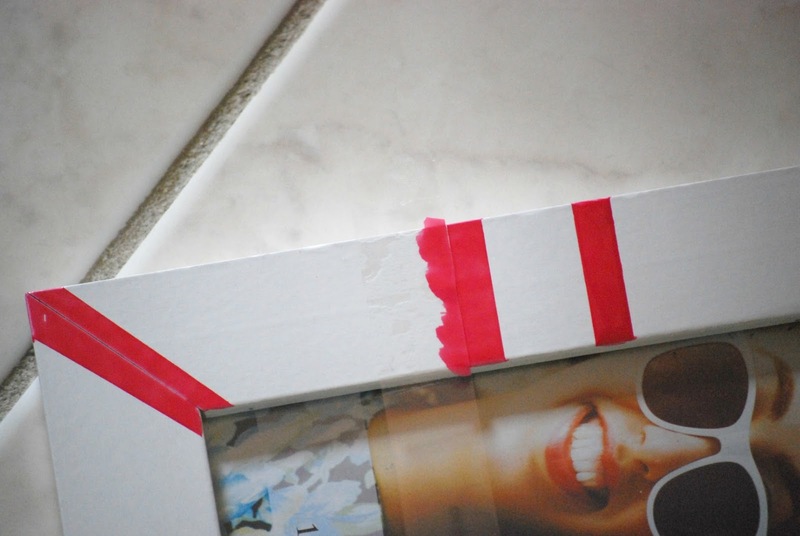 The first thing I did was place some sticky tape on the frame so I could use it as a stencil for dead straight lines. I painted in between the tape, waited around 30 seconds then removed the tape. Make sure your tape is pressed down fully onto the frame, otherwise the nail polish could seep under the tape and create messy lines. After I had all the lines I wanted, I just dotted the nail polish around until I achieved my desired look. 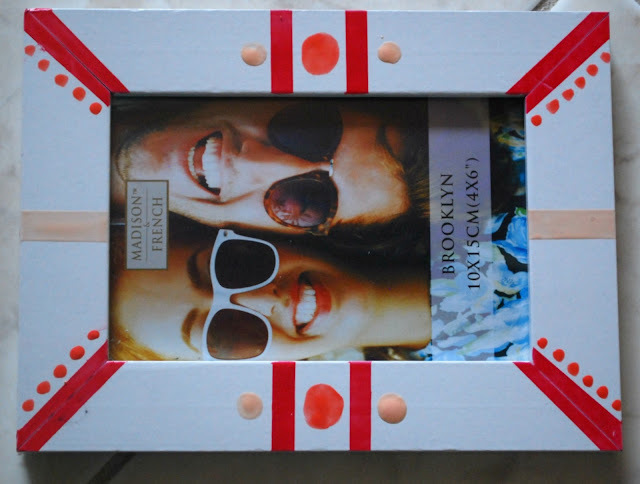 I absolutely love how mine turned out, and now I want to do this on all my photo frames! I also think this is a perfect gift idea for Christmas, and the receiver will love that you put time and effort into personalising their gift. My end of year tests are coming up, and I've been struggling with balancing studying, dance and my blog, so I think I am just not going to post for three weeks, and by then all my tests will have been completed.